We just release a new SirenOfShame.Device nuget package for controlling sirens from Universal Windows Platform (UWP) projects. Between that and the new cross platform soscmd.jar capability we released last week, and the original device api, there's no reason not to build that siren-based bathroom timer you've always wanted for your office. What's cool about our new UWP support is that you can now build apps for a wide range of devices including Windows PC's, tablets, (phones? ), Raspberry Pi's running Windows IoT, and even XBox (!). In fact, the first person that successfully runs a siren from an XBox gets a free mug (tweet us). The documentation is in the GitHub project, but at the moment it looks something like the following. We hope you enjoy. Please consider sharing anything fun that you create. If you have any questions please don't hesitate to ask on twitter, facebook, or here in the comments. Until today integrating a siren of shame device into non-continuous integration workflows has involved either writing a custom app or paying for a Team CI Pro subscription to get a custom HTTP endpoint for your siren. Even still the Linux story has been weak and the Mac story has been non-existent. Today we are happy to release a new tool to address non-CI, cross-platform, custom workflow requirements of siren owners. That tool is soscmd-1.0.jar. As with everything, soscmd is open source. All of the hardest work was performed with a generous contribution from Filip Hanik. We are very grateful to him for his help. Finally, this tool is also our first step in working toward a truly cross platform CI monitoring solution. More details to come. which will set the 1st led bar to 50%, the 3rd led bar to 100% and the remaining bars to off. That plays the Sad Trombone for 5 seconds. 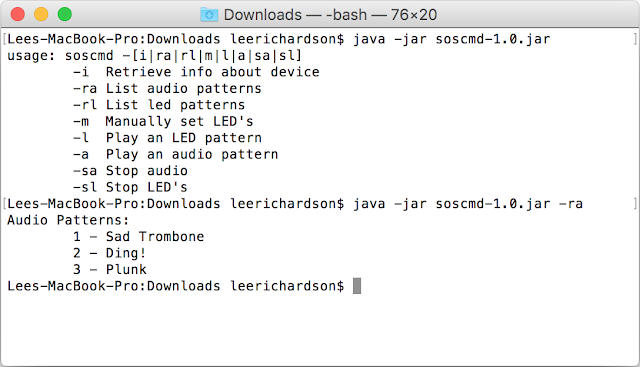 You can accomplish the same thing with a -l command to play led patterns or you can turn audio or led patterns off with -sa or -sl. That's it! Hope you enjoy, and if you do something fun with it please let us know. If you're a Team CI Pro user enjoying the weekly e-mails and stats, and thinking what fun you could have with that raw data (we won't judge), then we've got some fantastic news: we've opened up a new API just for you! 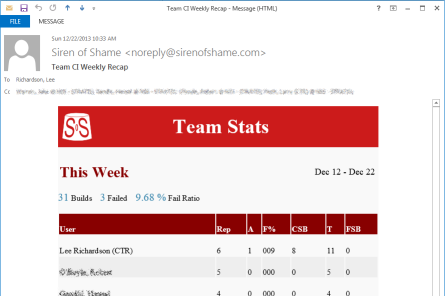 This API is basically a list of weekly snapshots of your teams stats. We originally took these snapshots to get the delta's that are in the e-mails. But now they're available for you to use and abuse. To get started you'll need an API key. To get it click the new "Get Your API Key" button in the Team CI section of the site. Then type your password, click the button and copy the resulting API Key. curl --url http://sirenofshame.com/ApiV1/Snapshots -H "Content-Type:application/x-www-form-urlencoded" -d "UserName=[Username]&Password=[ApiKey]"
Hope you enjoy. If you do something fun with the data please consider sharing by posting here or shooting us a note on twitter or Facebook.